Corrections, Cancellations or Change in schedule must be made at least 24 hours in advance for Nepal Samacharpatra and 10 days in advance for Kamana & Sadhana. Advertisements in conflict with public interest and against cultural morals will not be accepted. 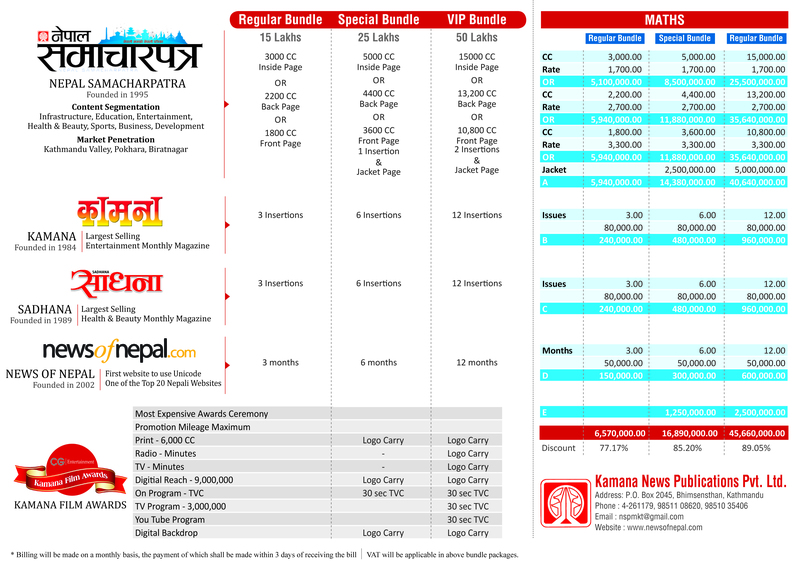 We reserve the right to revise the rate with 7 days notice in Nepal Samacharpatra. Advertisements/material and release instructions should reach us 24 hours prior to the date of release in Nepal Samacharpatra and 15 days in advance for Kamana & Sadhana. 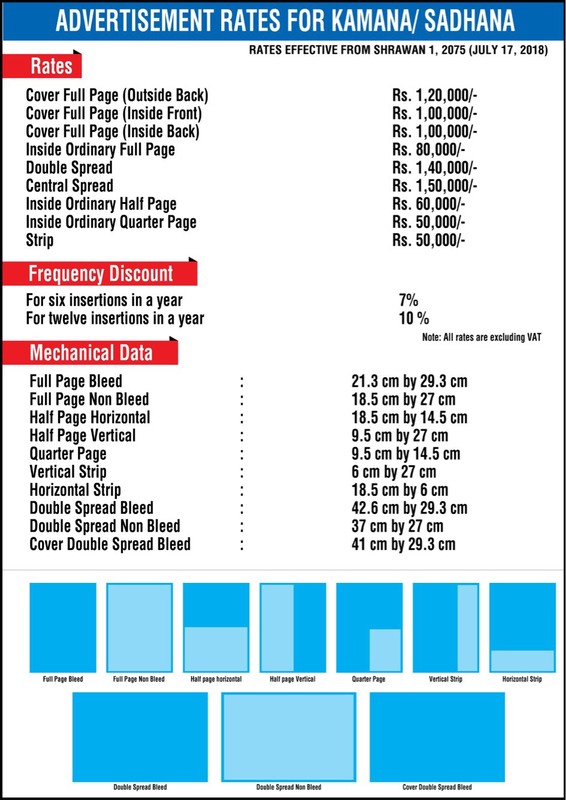 Ordinary ad printing mistake will not be entitled to free reprint. We also cannot assume any responsibility for printing errors caused by defective materials supplied by the advertisers/ advertising agency. Intimation of faulty or wrong insertion should be sent to us in writing within 48 hours from the date of insertion, or else any claim what so ever will not be accepted. The advertiser/advertising agencies will be solely responsible for the content of the advertisement placed with us. 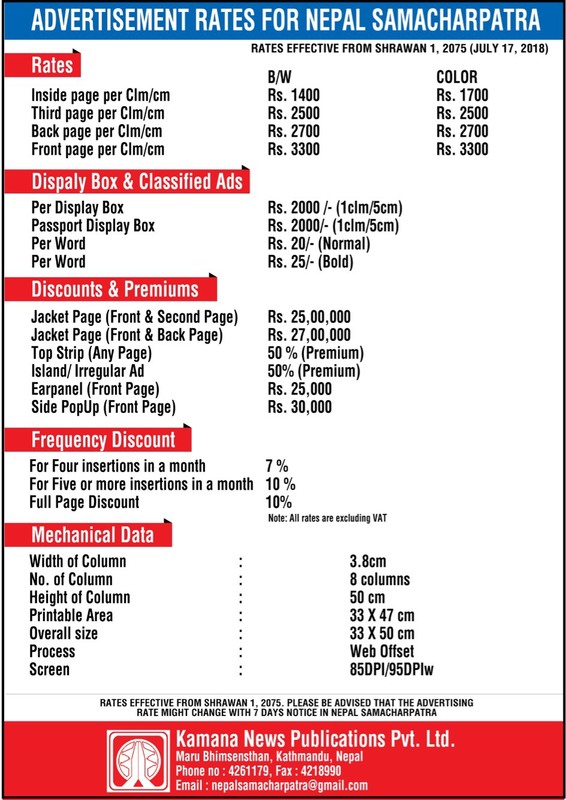 The minimum size of an advertisement is 1 column 5 cms. Fraction of a centimeter, for billing purpose will be taken as full centimeter. Only recognized advertising agencies with deposits will be offered 15% agency commission. Billing will be raised as per KNP’s rules. Therefore, advertising agency writing the billing amount on its own in advertising agency’s release order will not be accepted or entertained. 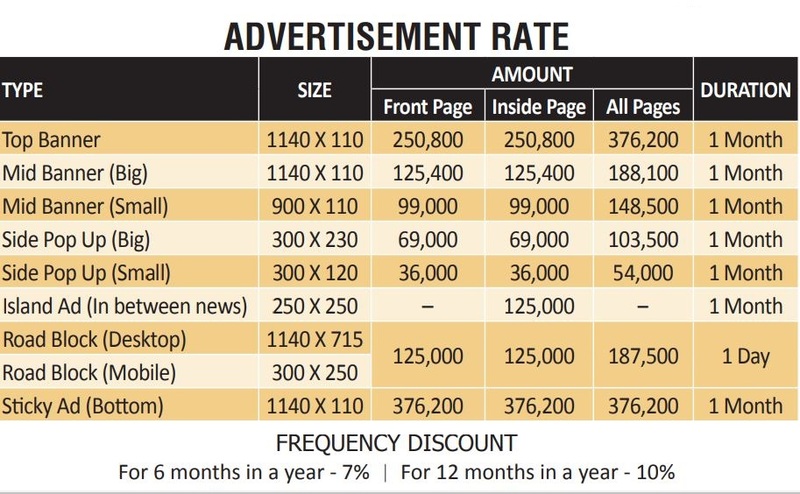 Frequency discount: All insertion dates & size must be mentioned on a single release order to qualify for frequency discount and all the ads must be published within 30 days of first published ad. Certified voucher cutting of advertisements will be provided on request latest up to 3 months of the date of publication. We reserve the right to cancel or reject advertisements at any time without assigning any reason what so ever. taxes & designing charges will be applicable. We reserve the right to revise terms and conditions without any prior notice.